Ever since the first trailer dropped, my anticipation for A Quiet Place was cemented. It raised even higher when the good reactions from various critics started to make rounds, with some even calling it a “horror masterpiece.” When I saw it last night I was sure to keep expectations to a minimum to keep from overhyping it, but I was pretty damn excited to see it. So after a lot of thought, I’ve come to the conclusion that it may very well be the horror film that’ll be haunting generations to come. The director of the film is John Krasinski, he also stars in it with (real-life wife) Emily Blunt. Millicent Simmonds and Noah Jupe play their children in the film, these names are likely not familiar to you but I’m sure they will be soon. In his third film, Krasinksi tackles the horror/suspense genre after helming two (not very well received) movies that were tame in tone. He kicks it up several notches with A Quiet Place as he has fun making you clench everything you’ve got when things hit the fan. A concept simple in nature, the film revolves around the idea of a family needing to be almost completely silent in order live their everyday lives. That’s all you need to know, the less you’ve seen from the trailers, the better. Silence is Krasinski’s weapon against the audience as he delivers quality scares and thrills that are extremely rare to find today. Although the film begins at a slow pace, the tension is never lost as every little noise is extremely evident in the sea of quietness. It also doesn’t go out of its way to explain how this family got to this point as the script treats the audience like they’re just smart enough to figure out what you need to know, but just enough to keep you on the edge of your seat. The way the family interacts with each other using sign language is also executed well since this is the only way to communicate in most situations. It’s not only believable, but it shows how much effort the cast went into making their interactions as realistic as possible. The acting is nuanced for the most part but hits some high notes when it comes to select sequences. 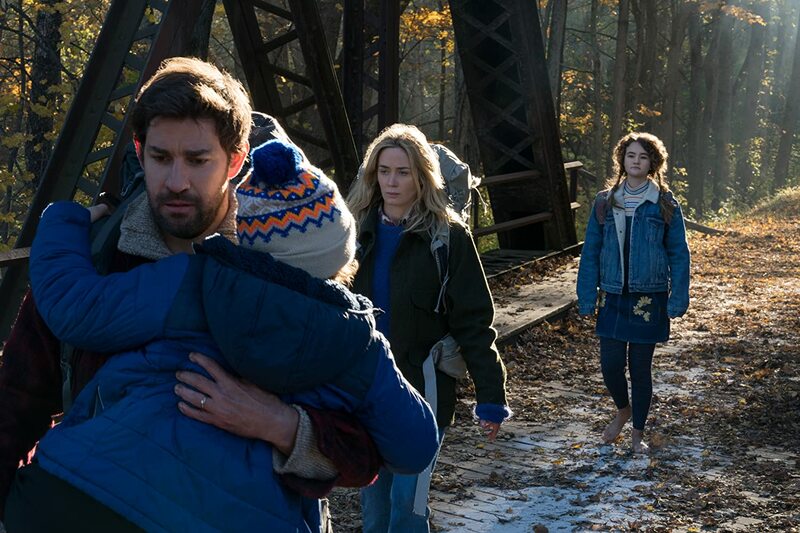 John Krasinski does a great job as the father, but Emily Blunt and the children are also huge standouts. Especially Blunt as she has some of the most intense scenes in the film, she’s simply a bad@ss mom in many ways. Out of the children, I think Millicent Simmonds (who’s also deaf in real life) really shows some serious acting chops when it comes to the core emotional scenes. The whole ensemble delivers performances that reflect the nail-biting nature of the film and I’m not sure they could’ve done a better job. There’s a lot of praise to be had for Krasinski’s directing and the performances, but no film is perfect and this one is no exception. The core story at hand is quite generic at points and this includes the emotional core of the film. The execution makes it stand out however and I didn’t really feel that it’s a big problem in the film. There are some small things when it comes to a character’s choice or two that are illogical, but if you can ignore it you’ll be ok with it. I’m trying hard not to spoil any specific plot elements as they are pretty crucial to the story, so this is as far as I’ll go. 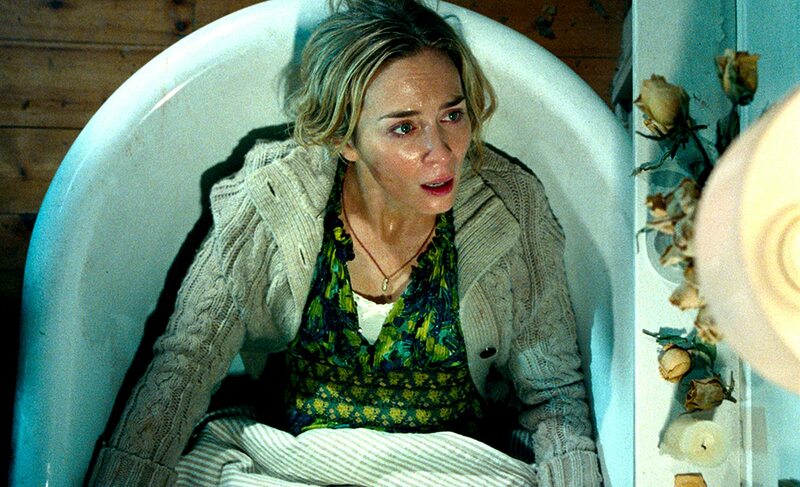 A Quiet Place delivered on everything I wanted in a horror film, from the acting to the thrills, this film will have you on the edge of your seat. You’ll be very satisfied if you’re looking to see not only the best horror film of the year thus far but possibly best period. Seeing it with a group of friends will probably be the best experience, but just make sure to keep quiet. The issues I had with it are a bit nit-picky, to be honest, and didn’t truly take me out of the move at any point. I’m not a big horror fan but I enjoy them from time to time with films like The Conjuring or It, this one is definitely in contention to be my favorite in recent memory.